By using a second light to ensure legibility in the shadows, we can place a "floor" on how low the tones will go on our subject. 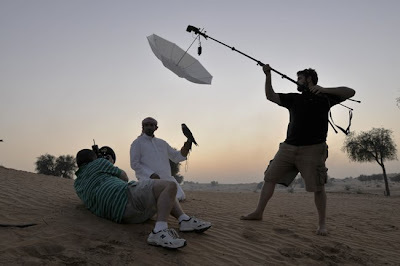 But we can also combine this with the fast falloff of a closely placed key light to get total control of a subject with an inherently tough dynamic range. 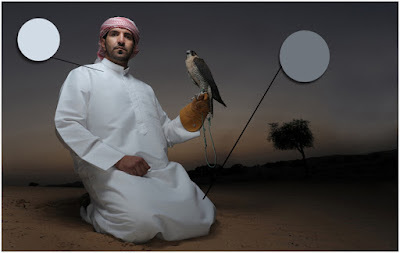 The above photograph of Omar, a falconer in the desert in Sharjah, UAE is a good example. Omar is wearing a bright white kundura, the traditional Emirati garment. 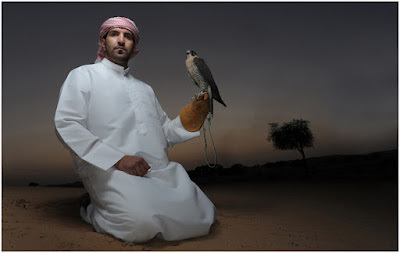 Fully lit, it's brightness would pull attention away from both Omar's face and his falcon. Using two lights, I can easily solve this problem. The fill light, which I placed first, is in a ring flash. 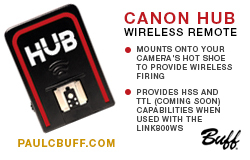 (In this case a simple ring flash adapter that mounts on a speedlight). This makes my fill light surround the lens barrel—and come from exactly the lens' axis. That light is underexposed a couple of stops, which turns the bright white kundura into an muted light gray. Now instead of too-bright white, it is almost pearlescent. As we shot, I directed Drew to bring the umbrella even closer still. That key light distance is very important. This ensures Omar's face receives a full dose of light, but the light falls off very quickly as it passes Omar's shoulders and heads down his torso. In effect, as we transition down his body we are also transitioning from key light to legibility light. A quick slope from full exposure down to our preset floor. The kundura is fully exposed only very near Omar's face. As you travel further down the garment, the light level it is receiving quickly falls—until it hits the "floor" I have set with my ring fill light. Rather than keeping our shadows from going to black, in this case the fill/legibility light is creating what will be the defining tone for most of his garment. As a bonus, the fill light is also giving us shadow detail in his eye sockets. Once again, working with two lights in tandem allows us to create a nuanced tonal structure that solves our "white garment fighting for attention" problem. With the close-in key light and no fill, we would get a quick falloff to a tone that would be too dark. With the addition of the second light, we have a quick falloff to an predetermined floor. And in this case, it was chosen to allow the kundura to still present as white — but in a way that would not be too bright and scream for attention. We want Omar's face to be the entry point, and with the muted tone on the kundura, it is. Imagine you are a wedding photographer and were assigned to photograph a bride with beautiful, olive skin and dressed in a $20,000 pearl-covered wedding gown. How would you do it? You could, for instance, light the dress and the face separately. By using a large, beautiful light source—like a 60" Octa or a flash fired through a bed sheet–you could light the dress and pearls to a full exposure. Then slowly turn down your light's exposure value until the dress and pearls simply glowed without blown out reflective highlights. 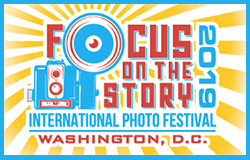 That would probably be about 1 to 1 1/2 stops underexposed, right? You can see it: reflective white slightly underexposed to create a delicate, pearlescent tone. Not unlike what we did for Omar. The bride's face, which is also in this same light, is also about 1 to 1 1/2 stops underexposed. Not a great exposure—but certainly a great fill light. So on top of this, you aim a grid spot at her face. Position it high, and on the face's axis; pointing it right on the nose as she looks a little bit away from the camera. The result: beautiful, glamourous cheekbones and radiant fill are already happening on her face because of the dress light. The grid becomes her "face-only" key light. And because of the narrow beam of the grid spot, each zone—dress and face—is receiving light that renders it beautiful. Two lights; a world of control.